We are primarily a River Cruise couple and being on a large ship for a week didn&apos;t seem to exciting to us. We received an invitation from a family member to join them and we did. The Oasis of the Seas is something special and from the first time we saw it in Port Canaveral as it dwarfed other ships, to an extremely easy bag drop off and check-in process to walking into the Promenade Deck 5, we were in awe. We purchased the Delux Beverage Package and I would highly recommend it. Beers ran approximately $8 - 10 dollars each, so if you plan to have five drinks throughout the day, it is worth it alone not to have the package and not worry about how much you&apos;re spending,,,, you&apos;re on vacation. We enjoyed the breakfast and lunches in the Park Cafe and the Solarium Bistro. The dinners in the main dining rooms were just OK+ considering how many guests they are serving. The several meals we had in Chops Grille were excellent (both lunch and dinners). The service was excellent for all meals. I would highly recommend the Specialty Restaurant Dining Package of which there are two. Entertainment was better then anticipated and although Cats is a very boring show, listening to Memory made it worth the long seating. The Aquatic Show was excellent as well as the Frozen In Time skating show. Come Fly With Me (Musical, Dancing and acrobatics) was awesome..... but the Headliner left much to be desired. All in all, our cruise was just wonderful and we will be looking forward to another cruise next year; or sooner. We are primarily a River Cruise couple and being on a large ship for a week didn&apos;t seem to exciting to us. We received an invitation from a family member to join them and we did. The Oasis of the Seas is something special and from the first time we saw it in Port Canaveral as it dwarfed other ships, to an extremely easy bag drop off and check-in process to walking into the Promenade Deck 5, we were in awe. We purchased the Delux Beverage Package and I would highly recommend it. Beers ran approximately $8 - 10 dollars each, so if you plan to have five drinks throughout the day, it is worth it alone not to have the package and not worry about how much you&apos;re spending,,,, you&apos;re on vacation. We enjoyed the breakfast and lunches in the Park Cafe and the Solarium Bistro. The dinners in the main dining rooms were just OK+ considering how many guests they are serving. The several meals we had in Chops Grille were excellent (both lunch and dinners). The service was excellent for all meals. I would highly recommend the Specialty Restaurant Dining Package of which there are two. Entertainment was better then anticipated and although Cats is a very boring show, listening to Memory made it worth the long seating. The Aquatic Show was excellent as well as the Frozen In Time skating show. Come Fly With Me (Musical, Dancing and acrobatics) was awesome..... but the Headliner left much to be desired. All in all, our cruise was just wonderful and we will be looking forward to another cruise next year; or sooner. 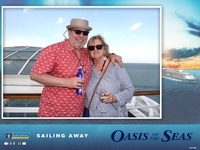 We enjoyed the larger balcony and the room is OK, as compared to other ships, but the Oasis is starting to show its age. Our Stateroom Attendant (Adela) was an absolute pleasure that did a superb job and always greeted us with a wonderful smile. There is plenty of storage areas and the shower and bath room are very adequate, even for a 6&apos;2 240 pound (before cruise) person. We would look into upgrading to a Junior Suite next time, especially based on the auction process that is in place.